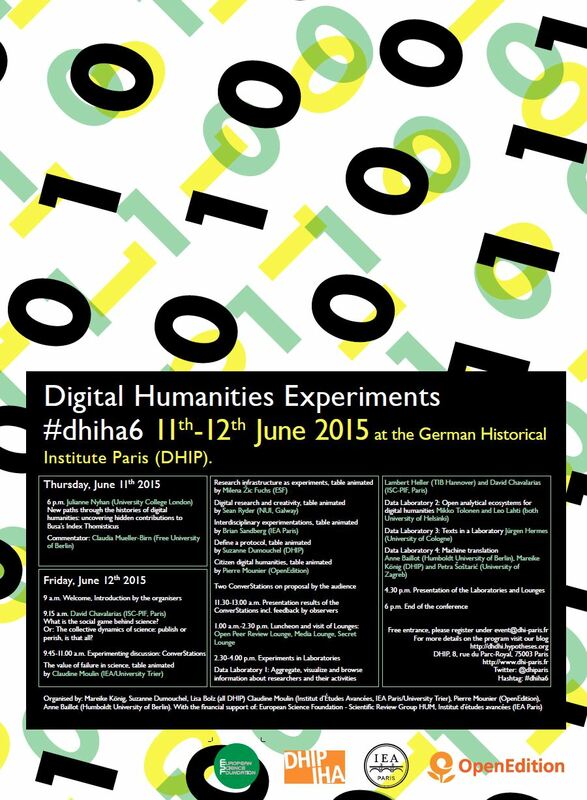 A conference on Digital Humanities Experiments was recently held in Paris on 11-12 June 2015 at the Deutsches Historisches Institut Paris (DHIP), or Instistut Historique Allemand. The conference was jointly sponsored by the European Science Foundation – Scientific Review Group HUM, the DHIP, and the Institut d’études avancées (IEA) de Paris. The conference was organized by Mareike König, Suzanne Dumouchel, Lisa Bolz (all DHIP), Claudine Moulin (IEA/University Trier), Pierre Mounier (OpenEdition), and Anne Baillot (Humboldt University of Berlin). The conference featured an intriguing mixture of presentation and discussion formats, including a keynote lecture, digital lounges, and discussion groups. I participated in the ConverStations section of the program, in which participants moved through a series of round table discussions on specific themes in Digital Humanities. I thoroughly enjoyed leading a ConverStation round table on “Interdisciplinary Experimentations,” in which participants discussed how to create interdisciplinary research and collaboration in the Digital Humanities. I felt that the ConverStations were very effective at producing new conversations and ideas among diverse participants from the humanities, social sciences, and computer sciences. Each group’s brainstorming discussions produced distinct ideas and proposals on the possibilities for interdisciplinary collaboration, as well as roadblocks preventing or disrupting interdisciplinarity. Masters students and doctoral candidates from universities in France, Germany, and across Europe participated in this DH conference. This entry was posted in Conferences, Digital Humanities, Graduate Work in History, History in the Media, Humanities Education, Information Management. Bookmark the permalink.